Former Union Minister M Venkaiah Naidu was on Saturday elected as the 13th Vice-President of India by defeating opposition candidate Gopalkrishna Gandhi with a huge margin. Naidu has secured 516 votes while Gandhi got only 244 votes. “I am very humbled. I am also thankful to the Prime Minister and all party leaders for their support,” Naidu said. “Coming from an agricultural background, I never imagined I would be here. 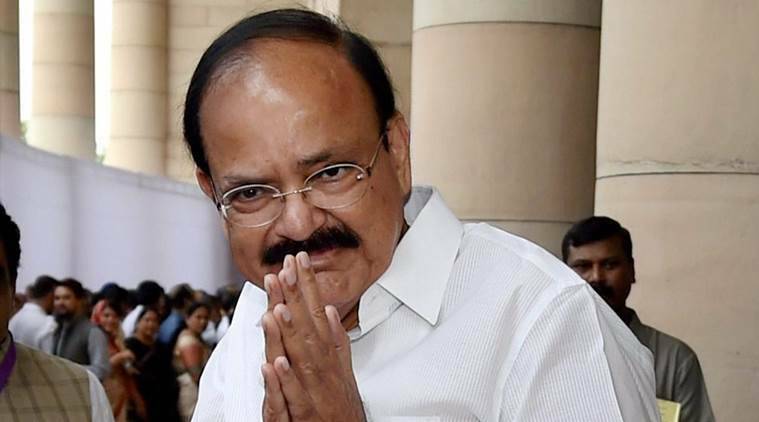 Agriculture has no proper voice in Indian polity,” said Naidu . “I will seek to utilise the vice presidential institution to strengthen the hands of the president and secondly uphold the dignity of the Upper House,” he added. 771 parliamentarians has casted their vote on Saturday, which turned out as a record of 98 percent voting in the vice-presidential election. However, 11 votes were found to be invalid, said Assistant returning officer Mukul Pandey. With a bachelor degree in politics as well as law, Naidu became a member of the Rashtriya Swayamsevak Sangh at a very young age. He joined ABVP in 1973 as a student leader. He was later elected as the student president of the Andhra University Colleges. During the Jai Andhra movement in 1972, Naidu emerged as a leader, taking charge of the agitation in Nellore. He also actively participated in the movement against the emergency in 1975 for which he was imprisoned. Naidu also became the President of the Youth Wing of Janata Party in Andhra Pradesh from 1977 to 1980. Known to be one of the most popular leaders from Andra Pradesh, Naidu was elected as an MLA to the Andhra Pradesh Legislative Assembly for two consecutive times. He was also the President of Andhra Pradesh State Unit of BJP from 1988 to 1993. Naidu rose to ranks by becoming the General Secretary of All India BJP from 1993 to September 2000. In April 1988, he was elected as the Member of Rajya Sabha from Karnataka. He was also BJP’s spokesperson from 1996 to 2000. In the Parliament, he was a member of committees that covered subjects like home affairs, agriculture, finance, rural development, external affairs. In 1999, under the Atal Bihari Vajpayee cabinet, Naidu was elected as the Union Cabinet Minister for Rural Development. Later he became the National President of BJP in 2002. He was selected for a second term in 2004 but resigned after BJP’s loss in the 2004 general elections. He was re-elected to Rajya Sabha again from Karnataka in 2004 and 2010. In 2006, Venkaiah Naidu became a member of the Parliamentary Board of BJP and Central Election Committee. In 2016, he was elected for the fourth term in Rajya Sabha from Rajasthan. Venkaiah Naidu is also well known for his oratory skills in the political circles. It is through him, that BJP was able to form an alliance with the Telugu Desam Party in Andhra Pradesh. He was also actively involved in the discussions related to bifurcation of Andhra Pradesh and formation of Telangana. Venkaiah Naidu will file his nomination papers on Tuesday. He is pitted against Opposition’s Vice-president candidate Gopal Krishna Gandhi. The elections are scheduled to take place on August 5.